Event tickets are a big business and startup FanSnap is entering the game with a compelling ticket search engine. FanSnap is launching the public beta of its nifty Kayak-like live ticket search engine for sports, concerts, and theater events. FanSnap, through partnerships, provides free ticket search results for close to 60 of the leading ticket providers, including StubHub, eBay, Ace Tickets, AllShows.com, Barry’s Tickets,Gold Coast Tickets, Las Vegas Tickets, RazorGator and TicketNetwork. The results include more than 12 million tickets to 40,000 events. FanSnap’s technology makes finding tickets to an event very simple. The site allows fans to see ticket selection and price ranges at-a-glance. 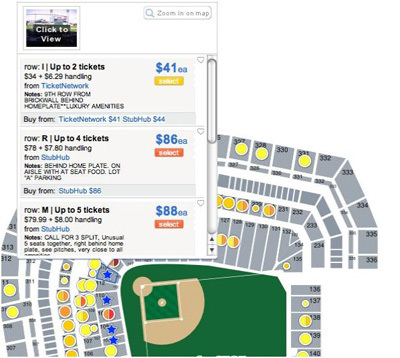 FanSnap uses sliders to allow filter to see tickets by price range, date, time, number of tickets available, and by the series of the event (baseball homestand, a multi-night concert performance, or a week of Broadway shows). Users get a comprehensive list of comparable ticket offers from multiple providers. The search results also make it easy for users to see the full price of a ticket on a ticket vendor’s site, including all taxes, commissions, and fees that may come with a ticket. Similar to Kayak, when a user clicks on a desired ticket, he or she is taken to the vendor’s page. Here’s the really cool part. Next to the search results, FanSnap has an interactive map of the event venue, which includes a “best value” feature that highlights at-a-glance those ticket offers that are priced significantly lower than surrounding offers. The value of the tickets are color-coded, with yellow being the lowest price and dark red being the highest price. The available tickets are distributed over the venue map, with the “best value” tickets as determined by FanSnap’s technology (the best tickets for the lowest price) represented by stars. But that’s not all. FanSnap’s map then lets users zoom into a row-level view of the available seats map (only created for around 200 of the top venues of the U.S, but will be rolled out to more venues in the future), to see exactly where the desired seats are versus the rest of the stadium or event space. FanSnap says that they plan on including actual “views from the seat,” a photo from the actual seat, in the future (they already have a partnership with seating chart site SeatData to create this feature). Competitor SeatKarma already offers such court-view photos. FanSnap is led by some pretty experienced people in the online tickets and search aggregation industries. CEO and co-founder Mike Janes used to be StubHub’s chief marketing officer. Steve Hafner and Paul English, co-founders of Kayak, are on the board of advisers. Co-founder Rishi Garg was the director of strategy and business development for MTV Networks. And FanSnap received $10.5 million in Series A funding from General Catalyst Partners, which is also one of the primary investors in Kayak. Janes says FanSnap’s biggest competitor is Google, since many consumers will type in the name of a desired event to Google’s massive search engine. But FanSnap, he says, solves the problem of filtering the legitimate tickets from the fake ones, and also provides real-time data. Other competitors include event ticket aggregator TicketStumbler, but FanSnap appears to have more ticket vendors (and thus reach), more interactive images and more features. FanSnap’s search engine is disarmingly good. Not only is it comprehensive, but FanSnap’s focus on visuals and images makes it really easy for users to see exactly what they are getting both in terms of value and location of a seat. Ticket selling is a dynamic industry—consumers often get ripped off or are charged unwanted fees. FanSnap adds transparency to the market by making side-by-side comparisons of fees vendors are tacking onto the value of a ticket. And FanSnap says that it fully vets each ticket vendor to ensure legitimacy and customer service.